Here is our Italian Crock Pot Pasta sauce that can be made in 10 to 15 minutes before you leave for work in the morning – and be ready for hungry mouths when you get home! Pasta may be one of the easiest ways to feed a large family. It’s inexpensive, and it goes a long way towards filling up hungry stomachs. 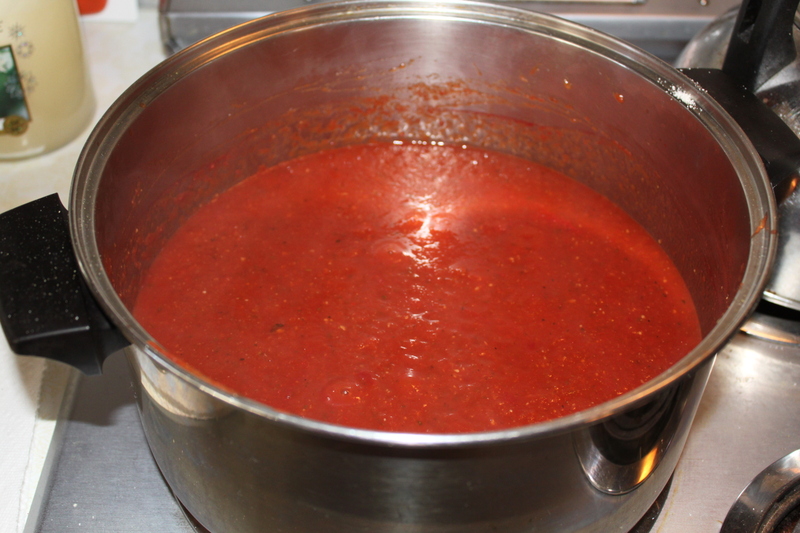 With everyone at the house involved in sports and activities – the crock pot works out great – we can make the pasta as needed – and simply ladle the hot pasta sauce over it, and your ready to eat. Although store bought tomato juice works great – this is an great way to use up tomato juice left over from last year’s garden in your pantry. 1 teaspoon each of dried Oregano, Italian parsley and Basil. Start by getting the hamburger browned. While that’s going, we pull out the crock pot and pour in half of the wine along with all of the other ingredients and turn it on high to get them a jump-start heating up. I’ll go back and drain the fat from the meat, and put it back on to finish browning, adding the other half of the wine into the browning meat for about another 5 minutes. Then place into the crock pot with the other ingredients – give it a final stir – set the crock pot back to low – and your done!! That’s it. Pretty simple. 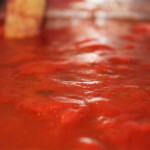 I will usually take off the lid when I come home for the evening and keep the heat on low…it allows the sauce to thicken even more before serving. We ladle it on top of each serving onto whatever pasta we are having that night. It works great with spaghetti, penne, rigatoni, or bow tie pasta. If we have any left over (which is usually not the case with the mouths we feed!) we just put in the fridge for leftovers. 1 teaspoon each of dried Oregano Italian parsley and Basil. Brown the hamburger in a medium sized skillet. In the crock pot pour in half of the wine along with all of the other ingredients and turn it on high. Drain the fat from the meat, and put it back in the skillet and add the other half of the wine into the browning meat for heat for about 5 minutes. Place the meat into the crock pot with the other ingredients - give it a final stir - set the crock pot back to low for 6-8 hours. I will usually take off the lid when I come home for the evening and keep the heat on low...it allows the sauce to thicken even more before serving. oldworldgardenfarms March 23, 2012 September 3, 2018 Cooking, Recipes, Sauces Dressing Jams Misc.